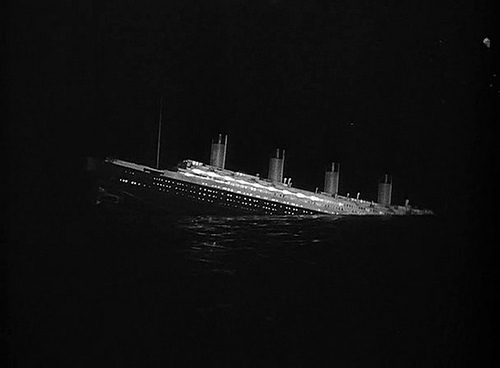 Before James Cameron’s Titanic and before A Night To Remember was the now infamous Nazi-based Titanic, the German retelling of the doomed sea vessel made as a propaganda film by Joseph Goebbels during the Third Reich. It was a massive production in its day with its dramatic license grossly exploited for propaganda purposes. Many of the people (Bruce Ismay, John Jacob Astor) and events were familiar, but it included a German hero as the moral conscious of the film, which served as the injection of Nazi misinformation designed to help the Nazi war cause. The film itself is certainly watchable from this historical perspective, though it doesn’t rise to the artistic heights of Leni Reifenstahl’s films. However, it does remain a robust action film with top notch production values worthy of the other Titanic films I mentioned, all taken with a large dose of salt knowing whose intentions the film was meant to serve. 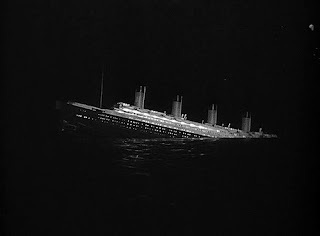 The film shamelessly establishes the evils of Western capitalism when we see the executives at White Star Lines, including the real-life Bruce Ismay, plotting a scheme to raise the falling price of its stock by overextending the seaworthiness of the Titanic. We’re then quickly put on the boat, the launch of which is visualized competently through stock footage of its real-life sister ship, HMCS Olympic. Ismay’s scheme involves not only publicizing the launch of the biggest ocean liner to sail the seas, but also breaking the cross-Atlantic sailing record by bringing it into New York ahead of schedule. To do this requires pushing its engines to the max and disregarding the danger of icebergs floating in the area. Ismay’s opponent comes in the form of the German First Officer, Herr Petersen (Nielsen), who opposes the self-centered money grubbing hedonism of the Western capitalists for the sake of the safety of the crew, in particular the poor third class patrons in steerage. Peterson’s characterization is shamelessly heroic, an outcast on the ship under constant suspicion of the ignorant Brits and Americans. Of course, this movie isn’t fooling anybody anymore, and we can laugh at such ludicrous propaganda. Back in the day, the production was controversial, as conflicts between the director Selpin and Joseph Goebbels resulted in his imprisonment and ultimate ‘suicide’. After its premiere, Goebbels banned the film when he realized the Allies were so close to Berlin and winning the war, the effect of showing such mass destruction would not serve his purpose. After the War the film virtually disappeared only to be resurrected by Kino Video in its current uncensored state.